In my previous article we created a simple app that interacts with the Twitter API and pulls down a single tweet from the public timeline. In a typical application, we want to pull tweets from a user’s timeline. iOS5 provides an API for securing authorisation details centrally and providing access to them to any application that wants it. This means that users only have one place to go if they wish to de-authorise or modify account details. Neat. 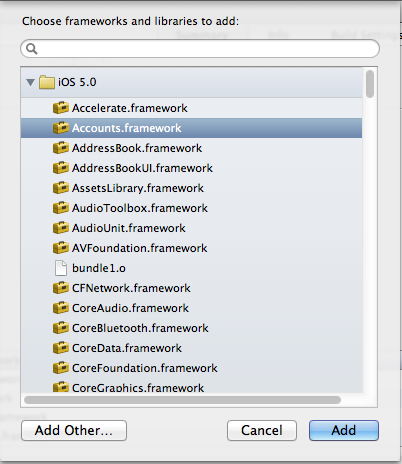 The Accounts Framework has notably sparse documentation for an iOS Framework. It is, however, relatively straightforward to use. The API is documented, but there’s no developer guide to using it at time of writing. Before we can use the code in the Accounts Framework, we need to add it to our application. Scroll down to “Linked Frameworks and Libraries” in your Project’s Summary section. Click “Add” and you’re done. 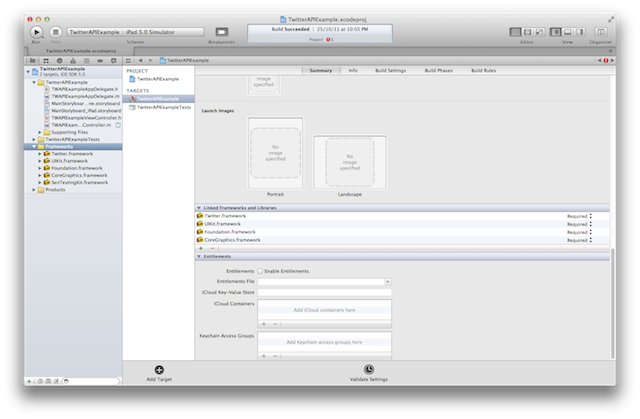 We’re going to add a new property to our viewController, ‘store’. This is a handle to the ACAccountStore, which we’ll need at several points in our application’s lifecycle. We’ve added an #import statement for the Accounts framework and added the store @property. Remember, we’re working with the code from the last article I wrote, which you can get access to via BuildMobile’s GitHub account. // We didn't get access, so we'll show an error and exit. // TODO: Show an error screen to the user and re-request permission! See how we used abort() up there? Having calls to abort() in your code will probably mean your application won’t make it onto the App Store. You’ll need to replace that call with a nice error screen for the user, letting them know what went wrong and giving them a way to fix it. That goes a bit beyond what I want to demonstrate here though, so like any good writer I’ll be lazy and skip over it. Now we need to modify our getTweet method to take advantage of the authorisation access we (should) have. The Twitter API URL for getting access to a user’s timeline is ‘https://api.twitter.com/1/statuses/home_timeline.json’. So we’ll modify the URL we’re accessing accordingly. // We need to get the user to add an account! // This is pretty cheap, but we'll zap them out to the Settings app, where they can add an account. // When they return, we'll re-run viewDidLoad to get access to the account. // TODO: Show a nice UI to your users to add/select which account they wish to use. Still a busy function, but not it’s even busier! As last time, in practice you’d really want to break this functionality up a bit and not do cheesy things like re-calling viewDidLoad. I’m trying to condense my code into as few functions as possible for the sake of illustration. We’re setting the account on the tweet request (line 109). And then, as before, we’re displaying the tweet we get back in a label. This is a very basic example of how to use the Accounts Framework with the Twitter Framework to get access to a user’s twitter account. In practice, you’d want to use an OAuth library to allow the user to create Accounts (in the AccountStore) from within your application, and choose which account to use. The code for this example is available on a branch on GitHub.